Wouldn’t you love to have this wise old owl overlooking your garden? 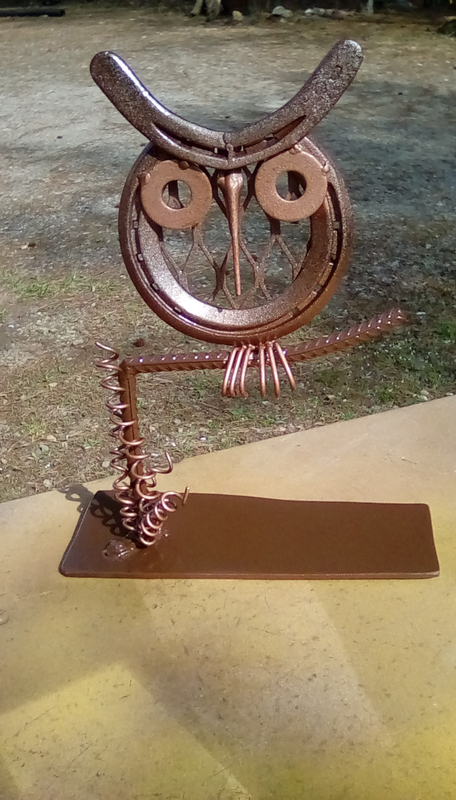 Stop by the Southside Master Gardeners Plant Sale on May 5th for this owl and other garden treasures plus lots and lots of plants priced to sell. The annual Southside Master Gardener Association Plant Sale will be held on Saturday, May 5th from 7:30 a.m. until 11:30 a.m. in the parking lot in front of the Halifax County Extension Office, 171 S. Main Street, Halifax. All types of plants will be available including annuals, herbs, perennials, vegetables, shrubs and trees. The sale will also offer handmade garden art. Using old metal car parts and other found treasures to make garden art is a great way to go green. 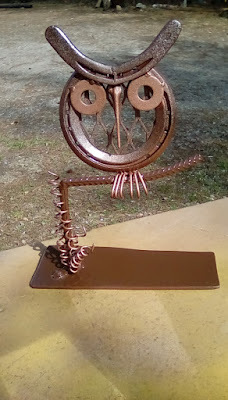 How creative to use horseshoes to make an owl’s eyes and an old garden rake for the wings. With some horseshoes, a hammer, a couple washers and some rebar you have a dog that will never bite. A cat was made with horseshoes, washers, locknuts, welding rods and rebar that will look lovely in the garden and will scare the mice and voles. This is just a sampling of the garden art for sale at the Plant Sale. year, there will be draped and basket hypertufa as well as traditional hypertufa containers. Some hypertufa was shaped to resemble stones and dressed up as beneficial insects, another great addition to your garden. New this year is papercrete, a process of making containers similar to hypertufa but more lightweight. The process involves making a pulp from shredded paper and mixing with Portland cement. Naturally, there will be lots of plants, priced to sell and locally grown. Master Gardeners will be available to answer your gardening questions throughout the sale. If you want more information or are interested in the Master Gardener program visit www.ssmga.org, like on Facebook, contact the Halifax Extension Office at 434-476-2147 or e-mail at ask@ssmga.org.